I picked up a pound of Toulouse sausage from Dai Due‘s Butcher Shop this week and prepared, as they suggested, a pot o’ black-eyed peas. Not that I needed persuading. In season, I boil up a batch of cowpeas almost every week if I can. The toothsome Toulouse, fashioned from Richardson Farms pastured pork, and Frenchly flavored with white wine, garlic, black pepper and other spices, tasted right at home with my fresh Texas field peas (2 pounds) and fresh backyard herbs—French thyme, savory, sage and bay. Farmers market onions and lots of sweet peppers—golden Anaheims, lime green cubanelles and pine green bells, plus plenty of garlic, rounded out the aromatics. I used up that quart of turkey broth from the freezer. And I even put in leftover canned green bean liquid and a gnawed up pork rib from Artz Rib House (their grilled veggies are very good). Recombinant cooking is in my DNA! When the beans (black-eyed peas are beans) had cooked to tenderness, about a half hour, I jiggered in a shot of cider vinegar (Spectrum organic) and let it bubble a bit. The sausages, well-seared and sliced, jumped in last. Jasmine rice (Texas-grown Lowell Farms organic) completes the scene. Well, my Moist ‘n’ Corny Cornbread recipe yields enough for leftovers, and what meatier way to use up a third of it than to make tamale pie. Any variety of locally raised ground meat will work in this skillet classic. This week I chose Thunder Heart Bison—very lean. Richardson Farms pastured pork or grassfed beef, Premium Lamb‘s goat, and Loncito’s Lamb will each give great results. You can find all of these producers at both the Sunset Valley Farmers Market and the Austin Farmers Market. Being a quick and easy dish, you may find you have time to relax (who gets to do that?) after dinner. You can even make this meal using leftover chili, about a quart, in place of the ground meat mixture. Just heat the chili in the skillet, top it with the cornbread and cheese and bake it up. 12 ounces (about 3 ½ cups) crumbled cornbread. About 1/3 of the pan of Moist ‘n’ Corny Cornbread. 8 ounces (2 cups) shredded cheese. I like about 5 ounces pepper jack and 3 ounces cheddar from Full Quiver Farm. 1 pound ground meat—see above. 2 Tablespoons olive oil. Texas Olive Ranch‘s arbequina varietal is smooth and buttery. about 1 cup coarsely shredded butternut squash. I like Flintrock Hill’s selection. about 1 cup medium-fine chopped sweet peppers. If all your diners are of age, you may include a hot pepper or two. a couple of medium-sized tomatoes, chopped. If your local sources have dried up, use 1 cup canned diced organic tomatoes. I use Muir Glen or Central Market or Whole Foods brand. Whichever is on sale. a couple or so cloves of garlic, minced. Local, if you or Morning Glory Farm have any left. Domestic organic otherwise. 2 Tablespoons best quality chili powder. I make my own. 1 25-ounce can organic pinto beans, drained. Don’t bother to rinse. Canned beans have been on special lately at our area stores. You can use 2 15-ounce cans. This recipe obviously leaves room for flexibility and creativity. So an extra 5 ounces of beans won’t do any harm. Just be sure to taste for adequate seasoning and correct if necessary. Toss cornbread and cheese together in a bowl. Set aside. Preheat your oven to 450º. Heat up the olive oil in a large (11″ or 12″) ovenproof skillet. Add the onion, cook for a minute, then add the squash. Stir everything around for a bit and add the peppers. After a couple minutes of occasional stirring, add the tomatoes. When your veggies have softened, mix in the chili powder and garlic. Add the ground meat. Cook, breaking up the clumps. When the meat is cooked through, add your beans and salt. Cook and stir until hot. Adjust seasoning. Top the whole mess with the cornbread mixture. Place in the oven and bake for about 15 minutes, until crust is golden brown. Serve hot with salsa on the side, if desired. 1 Tablespoon cocoa powder—natural, not Dutch-processed. I use Dagoba organic. 6 Tablespoons various ground chile powders. I like a blend of smoked paprika, ancho and New Mexico. Central Market’s bulk department carries many types. You can smell, ponder and choose to your taste. I store my chile powders in the freezer. 1 Tablespoon freshly ground black pepper. Mix everything together and transfer to an airtight container—I use a glass jar. Depending on how frequently you use this blend, you may want to store it in the freezer. My blogger buddy austinfrugalmom recently rapped rapturously regarding Home Slice’s popular pizza on yelp.com. I don’t know New York pizza, but I sure love those crusty wedges. On working Thursdays, when I can’t bake my own pies, we order a large cheese pizza from Home Slice and pick it up to go. For thrift’s sake, plus customized, crispiest slices, we perform the topping at home and brown ’em further in the toaster oven. The kindergartner prefers a naked wedge, and hasn’t yet evolved into a crust connoisseur, so his pieces fly straight from the box onto his plate. The grownups of the house like onion slices, olives of any hue, jalapenos, black pepper, red pepper flakes and extra oregano. We all indulge ourselves with flurries of real Parmiggiano Reggiano. The large customizable pizza sets us back less than $15, and the home-toasting yields the crispiest, crunchiest crust you can get. Now that’s a Home Slice. With HEB’s bargain crop of Texas corn (3 ears for $1—check my “cheap tweets” for more specials), you can bake a large panful of corn-filled cornbread. Eat some hot today and the rest will still taste moist and delicious tomorrow—even if you forget to cover it!. Save about a third of your batch in the refrigerator to make a skillet tamale pie this weekend. 4 ears fresh Texas corn, shucked and roasted naked (the corn I mean. But I usually won’t try to tell you what to wear when you cook.) in the toaster oven at 400º just until done. The corn cookin’ can be done ahead of time. 1 stick organic butter, melted and cooled. Organic Valley Pasture butter or Lucky Layla lend luscious richness here. 112 grams (1/3 cup) local honey. I buy Good Flow in bulk at Central Market. 122 grams (about ¾ cup plus 1 Tablespoon) whole wheat pastry flour. I buy the Arrowhead Mills 5# bag at Whole Foods. Store it in the freezer for freshness. 4 1/8 ounces (¾ cup) organic cornmeal. Arrowhead Mills again. 1 ½ teaspoons baking powder, pressed through a fine-meshed sieve. ½ teaspoon baking soda, sieved as above. Grease up your 9″ X 13″ baking pan. Butter, coconut oil, corn oil, bacon grease, lard—several tasty fats will work here. Get your oven heating up to 350º. Uncob the corn kernels. I like to cut the cobs in half (crosswise), stand them upright in a bowl and flay them with a chef’s knife. I’ll admit to performing this operation ungracefully. A corn zipper is ideal here. 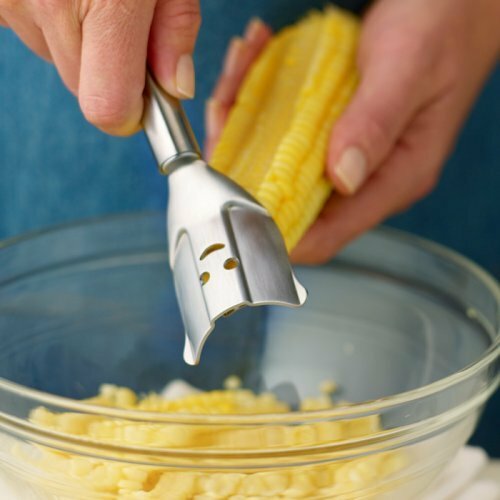 Scrape the cobs with the back of a knife—I use a butter knife for this part—to glean all the goodness. You’ll need about 2 ½ cups of corn kernels. The baby might like to play around with leftover surplus, especially if it’s still on the cob. Of course the baby will even enjoy the stripped cobs! What isn’t an edible toy to an 11-month old? Put 1 ½ cups corn kernels and the next five ingredients into your food processor (a blender should work, also) and let ‘er go for about 20 seconds. Pour mixture into a bowl and stir in the remaining (1 cup) corn. In a separate bowl, whisk together pastry flour and the next three ingredients. Dump the flour mixture into the wet ingredients and whisk together well. Pour into your prepared pan and bake until browned and cooked through, about 35 minutes. Serve hot with butter and beans. If I can’t make it to a real live Dai Due event, at least I can purchase their fine charcuterie. Wednesday we picked up a pound of hand-made venison sausage. Four naturally encased links filled with Broken Arrow Ranch‘s field harvested (wild!) deer meat and Richardson Farms pork. Subtle seasonings allowed this cook to put ’em in the bean pot for red beans and rice. Today’s Monday, after all. QUICK RED BEANS AND RICE—-The only thing authentically Louisiana about this batch o’ beans is that I cooked it on a Monday! ½ Tablespoon high smoke point oil, such as Spectrum’s organic peanut oil, or local lard. Dai Due’s rendered pork fat is toasty and tasty. 2 Tablespoons olive oil, lard or other flavorful fat (local and/or organic preferably). See “Stock Tips” for my fat saving technique. a couple of onions, chopped how you like. Whatever color you have will work. a couple of bell peppers, chopped as you please, any colors. 1 whole (uncut) jalapeno, serrano or other spicy pepper. Go ahead and chop it up if you don’t have kids. a couple of bay leaves—We’ve been growing a bay leaf bush for about a dozen years. If you have space for this small tree, go for it. You can’t beat fresh bay leaves for flavoring up almost any dish, even some desserts. fresh thyme and marjoram—These herbs grow well in pots if your garden space is limited. lots of chopped garlic. Morning Glory Farm plans to bring their last little bit of local stinkin’ rose to Sunset Valley Farmers Market next Saturday. We’ll see which locavores get there first! celery analog–I have yet to get some cutting celery growing. Of course we’re not finding local celery right now, and even in season celery makes rare appearances around here. So I often throw some celery seeds into preparations that require that saline/herbal flavor. Whatever you have on hand, add an appropriate amount (plenty of celery or just a dash or so of celery seeds). 1/2 Tablespoon smoked paprika, unsmoked is OK.
2 cans (15 oz.) organic red beans. Whole Foods is selling Westbrae canned beans for $1 each. At that price you can’t afford not to go organic! Cook your sausage. Heat up a large (12″) skillet on high heat. Add your grease, swirl to coat the pan, then lay in your links. Brown them on one side, flip ’em over and brown on the other side. Turn the heat down a touch to minimize smoking. I try to brown the sausages on their outer curves, also, but the links don’t always cooperate. Pour in a cup or so of liquid (water, broth or beer). It should bubble up right away. Cover the pan, lower the heat and simmer for 5 minutes. Remove links from the broth (reserve the liquid), and set aside. In a large (3-quart at least) saucepan, heat up the 2 Tablespoons of oil or fat and saute the next seven ingredients. When your aromatics have softened, stir in the paprika for a half minute. Pour in the liquid from the beans, plus the sausage cooking broth. Bring to a boil, then add the beans and the next three ingredients, to taste. Simmer a bit to blend the flavors and cook out the raw vinegar’s sharpness. When it’s just right, turn off the heat and add the sausage, cut into bite-sized pieces, and black pepper. Stir it up. Of course, if fresh parsley and green onions are in season, at the markets or in your backyard, chop up a bunch and sprinkle over your beans. Serve over hot cooked Lowell Farms Texas grown organic jasmine rice. See Jasmine Rice. Another goat meat recipe—a harbinger of goat things to come, thanks to Dai Due‘s upcoming “Goat Head-to-Tail” dinner at Hotel Saint Cecilia. Out of all my bread and baking cookbooks, and I have too many, I can’t think of a one that gives a recipe for Chinese steamed buns. Bread books may shed light on such boules as pancakes and crumpets—cooked on the griddle, waffles—baked between hot metal plates, and even dumplings—simmered atop stew or fruit. And of course you’ll find that American classic, steamed brown bread. To get instructions for Chinese-style steamed breads, however, we must consult our Chinese cookbooks. Or the internet. That erudite expert on culinary sinology, Barabara Tropp offers generously detailed, friendly guidance on bun-making in her excellent reference, The Modern Art of Chinese Cooking. Here’s my version of steamed buns, goated. You can prepare the goat meat filling a couple days in advance of forming the buns. Plan on making the dough at least the night before you intend to steam ’em up. The dough should also hold for a couple days, refrigerated, to await a convenient time. You will need a large diameter (10″) tiered steamer. I prefer the inexpensive bamboo models. Mine came from the thrift store but you can easily find one at an Asian grocery store. 1/2 pound eggplant. Lots of eggplants at the markets right now. I love the little lovelies from Ringger Family Farm. 1/2 pound ground goat meat. Premium Lamb markets their meat at Sunset Valley and downtown. 1 Tablespoon soy sauce. Eden organic is delicious. 1 Tablespoon peanut oil or other high smoke-point oil. Whole Foods now carries Spectrum organic peanut oil. 1 plus 1/2 teaspoon curry powder, preferably Chinese-style. Barbara Tropp’s China Moon version is excellent. 1 Tablespoon cornstarch—Rumford packages a non-GMO cornstarch. some chopped garlic chives, optional. They’re easy to grow year-round here and add a welcome nuance when scallions are unavailable. Cut up your eggplant into bite-sized pieces. “Bite-sized” is open to interpretation. Toss the eggplant pieces with the 1/2 teaspoon curry powder and a pinch of kosher salt (I use Diamond brand.) Combine the goat meat with the remaining ingredients and mix together until well amalgamated. Heat up a non-stick or well- seasoned pan or wok on medium-high heat. Add the oil and then the eggplant. Stir fry until eggplant is browning, then add the goat mixture. Continue to cook until the meat is done, showing no pink. Remove from heat and drain off the excess fat in a fine-meshed sieve set over a bowl. For this and other straining tasks I often use a re-purposed splatter screen–found frequently and inexpensively at thrift stores. I like the wide surface area. I also like to re-purpose the flavorful oil that drips out of the filling. It’s fine and tasty for brushing onto tortillas for quesadillas or just adding to the quinoa pot. Cool your goat off, then either refrigerate it or get ready to roll! 224 grams (about 1 ¾ cups plus 1 ½ Tablespoons) organic all-purpose flour. I’m finding the best flour prices at Whole Foods lately. 224 grams (about 1 ¾ cups) organic white whole wheat flour. Ditto. rounded 1/8 teaspoon salt, optional. Omit if using baking powder. 1/2 teaspoon toasted sesame oil. Spectrum bottles an organic version. Stir the sugar into the water and sprinkle the yeast on top. Let sit about 10 minutes, while you get the rest of the recipe together. I use a stand mixer to knead this dough. You can also use a food processor (much faster) or your own hands (much greener, probably more therapeutic, too). For the mixer, put the flours into the bowl, add the liquid and use the dough hook to work the mass until springy and well-kneaded. If using salt, add it after the ingredients come together. You’re going for a firm dough here. If necessary, add drops of water or spoonfuls of flour (all-purpose) until the dough masses together obligingly. For the food processor, put the flour into the work bowl, turn the machine on and pour the liquid in through the feed chute. Run the machine until the dough comes together, adding water or flour as necessary to achieve cohesion. Run for another 1/2 minute to work the dough. Remove the dough from the work bowl (add the salt now, if using) and knead it by hand for about 3 minutes, until the it’s firm and springy. If you’re making this dough entirely by hand, first of all, bless you. That’s green and good exercise, to boot. I know from my firstborn that as soon as I get my hands into some dough the baby will be pooping on the carpet or diving face-first onto the floor. So I use a machine. At any rate, put the flour into a bowl, make a well in the center and pour in your liquid. Stir with your fingers until a dough starts to form, adding water or flour as needed to develop a cohesive mass. Turn it out onto a lightly floured board or countertop—actually a silpat is the ideal surface for most dough deeds. Work that mound, kneading vigorously for 10 minutes or more, to achieve a smooth, firm dough. Coat a large (3-quart or so) bowl with the sesame oil. Ball up your dough into a round and wipe it around the inside of the bowl to grease it up. Cover the bowl with plastic wrap or a lid and refrigerate it overnight. In the morning, punch the dough down and commence to bunnin’ your goat or return the dough to the fridge to rest coolly until you’re ready to roll. When it’s time to make the buns, watch this video clip. I won’t say that that’s how I do it, or that it’s even how Barbara Tropp explained the process. But I think you’ll get the idea, and frankly, if you’re not selling your buns at a dim sum joint or entertaining Chinese dignataries, you can get away with non-traditional, best-effort technique. As long as you don’t overstuff the buns (VERY important) and you seal them well, you’ll turn out a terrific snack. Cut out 20 approximately 2″ X 2″ squares of silicone-coated parchment paper. I use If You Care brand unbleached parchment, available at Central Market and Whole Foods. Remove your ingredients from the refrigerator and punch down your dough to remove accumulated air. Now I get out my silpat again. A lighty floured counter or board will suffice, but if you do much dough work, you’ll really appreciate that slippy yet grippy surface. If using baking powder (a la Tropp), press it through a fine-meshed sieve onto the dough and knead it in by hand. I usually forget to add the baking powder, and my buns are always fine. Divide the dough into two halves and return one half to the bowl and the refrigerator. Roll your working dough piece into a log (for more accurate eyeballing) and divide it into two halves. Cut each half into 5 pieces. I use the back of a knife to first score the dough, for better guestimating. Then I commit to my cuts. Working with one piece (1/20th) of dough, first form a ball. Flatten it into a round pressing the heel of your hand around the perimeter. You’re aiming for a 4 ½” circle that’s slightly thicker in the middle, with evenly thinner edges. See the video. Tropp recommends a 1″ thick dowel rolling pin. I feel more adept at the primal hands-only method. Go at it however you feel most comfortable. Place 2 Tablespoons (cooled!) filling in the center of the dough round. DO NOT OVERSTUFF! Notice in the video that the bun maker removes the excess portion of the filling. Pick up the bun, cradle it in your palm, and begin pleating the edges together, over the top of the filling. Tropp instructs in great detail the interplay of your various digits in plaiting the pleats. The video illustrates yet another method nearly impossible to explain with mere words. How do you describe the digital do-si-do? I work the bun intuitively, reliving my childhood Play-doh days. Do the best you can. You’ll get better and faster as you go. When you’ve completed the pleating, pinch all the pleats together and twist the bun shut. Set the finished bun on top of a parchment square and place it on a baking sheet. Repeat with the remaining dough and filling. If you have extra filling, eat it with rice or feed it to the baby. If you have extra dough, let it rest, covered air-tight in the fridge, and I’ll give you a bonus recipe. When you’ve rolled all your rolls, cover them loosely with a piece of plastic wrap (or green alternative, such as a large aluminum roasting pan), and let them rise until springy to the touch, about 30 to 60 minutes. The timing will depend on the usual doughy factors such as ambient temperature and humidity. I may even turn the ceiling fan on to slow ’em down to my own speed. And unless the kitchen is cold (how long has that been? ), I keep the dough I’m not presently handling in the fridge. That way I can keep up, even if we have a baby emergency–which we certainly will! Towards the end of risin’ time, get a 10″ diameter (to match your steamer basket) pot of water boiling. Use plenty of water ’cause you’ll be steaming your buns for 15 minutes. Place each bun, still on its parchment square, into the steamer baskets, leaving about 1 ½” between them, to allow for their expansion. Stack your steamer atop your boiling pot—be sure to place the lid on the steamer—and steam for 15 minutes. Remove the entire contraption from the heat and WAIT for 5 minutes before slowly opening the lid away from yourself (so’s not to get a face full of hot steam). Your buns are hot and ready now! Store leftovers in the fridge and reheat them by steaming for another 15 minutes.